This summer has been a season of potluck dinners and long, drink-filled rooftop conversations. Though I love to cook I am hardly a natural, I depend on my library of cookbooks to an almost irrational degree. Friends are always surprised to find out that my favorite cookbook author is Isa Chandra Moskowitz of the Post Punk Kitchen. I may not be vegan, but I find her meat and dairy-free recipes incredibly flavorful and her writing style captivating. As an added bonus, her dishes can be enjoyed by the meat eaters, vegetarians and vegans alike. 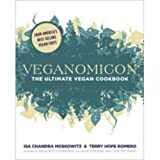 Moskowitz's cookbooks Veganomicon and Vegan with a Vengeance (written with Terry Hope Romero) are easily the most dog-eared volumes in my colection, rarely a week goes by that I don't cook at least one recipe from them. To enter this week's contest, leave a comment with the name of your favorite cookbook or cookbook author to win these two cookbooks and a $100 Threadless gift certificate. If you don't cook, or don't have a particular cookbook you enjoy, feel free to state that instead. The winner will be chosen randomly at midnight ET Friday evening (August 17th).